Power dividers are grouped into Hybrid/Wilkensen and Stripline/coaxial designs. Hybrid designs are characterised by port-to-port isolation of 20 dB or more and are typically used in receiver multicoupler or low power signal booster applications. 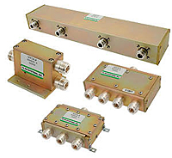 Stripline splitters have no port-to-port isolation and are most typically used to feed transmitter power to multiple antennas for phased arrays or similar applications. The models below are characterised by low-loss above the splitting loss and wide bandwidths.